The TSA is one of the stars in the US Government\’s security theater that keeps the public always fearing attack. 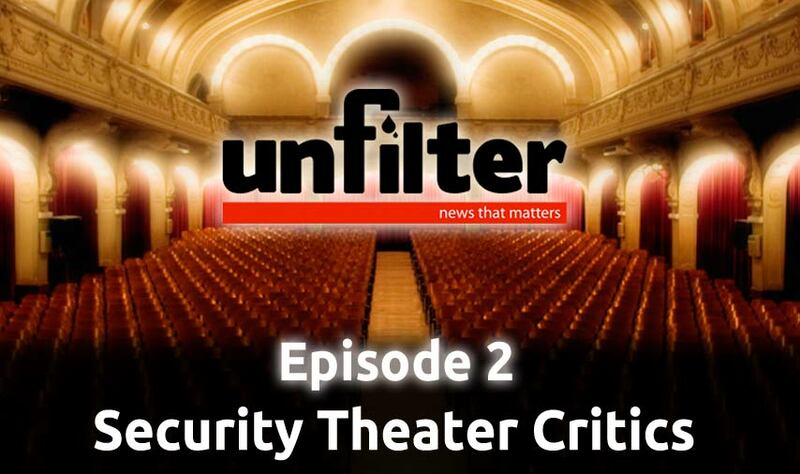 In this week’s episode we’ll demonstrate how the media is used to manipulate public support for sweeping security changes. Plus – We’ll unfilter some headlines, and cover your feedback from our first episode. How much is being spend on the TSA’s? The TSA accounts for 13% of the Department of Homeland Security\’s annual budget. Was hoping for a video show, LAS and SNAP are great because of that. If you are going to be doing shows on political issues, you at least have to make some kind of attempt at balance. You are going to have to present arguments from all sides of the issue and you need guests on the show to argue the opposing sides. I think it\’s about time more people did discuss issues that do really matter. While not everyone may agree with topics that are political or religious, its discussion that needs to happen. I would suggest sticking to the facts as much as possible, and unfortunately there are many facts that challenge popular beliefs. One advantage of the IT industry is that most \”wise\” decisions are based on facts and statistics. I think of this content as educational, better for the greater good of people. Al Qaeda Working To Surgically Implant Bombs In People & Even Pets!